Nearly 50 percent of all home loans are made by mortgage lenders that are not banks. Non-bank mortgages offer benefits for many borrowers—if they know which loan terms to look for and which to steer clear of. 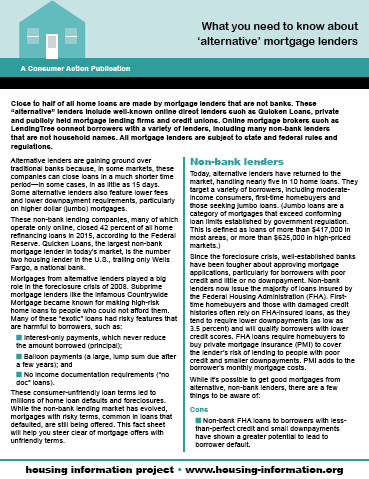 In addition to highlighting potentially risky loan terms to avoid, this fact sheet explains the consumer protection requirements lenders must meet and offers tips and resources for homebuyers shopping for a mortgage. The Buying a Home Leaderʼs Guide provides detailed information, written in question-and-answer format, to help teach potential homebuyers how to navigate the often complex process of purchasing a home. The guide covers such topics as how to choose a real estate professional, how to qualify for a mortgage, and what is involved in the settlement (closing) process. It also explains unfamiliar terms and provides tips and suggestions to help the purchase process go more smoothly. This PowerPoint training file is available for download in the “Download File” section. Buying a home is a major achievement. But successful homeownership does not begin and end when the closing documents are signed. This Leader’s Guide provides information and background to help you teach prospective, new and established homeowners what they need to know to be successful at homeownership.